One of the major concerns in the Hellenic Arms Control Center is the riots that are expected to erupt sooner or later in Greece due to its collapsing economy. Hundreds of thousands are expected to lose their jobs in the following years (both in the public and the private sector) and this will ignite violet street riots and demonstrations. The Greek Police will have to respond with riot control squads, tear gases and all other available measures but this may not be enough. The Greeks are a proud nation currently feeling the international humiliation as their country is considered by many to have gone bankrupt. Extremists have found fertile soil to propagate their ideas of rebellion while people fear that in case of an insurrection only the Army will be able to control the situation. In this dark and uncertain environment the Hellenic Arms Control Center has founded the Hellenic Civil Guard in an effort to mobilize the most dynamic and reliable members of the Greek society. The Hellenic Civil Guard has publicly announced its efforts and called for applications and recruits regardless of their political beliefs (rightists, leftists etc.) as this is a non-profit, non-partisan body of all Greek Citizens who wish to contribute to the security of their homeland. 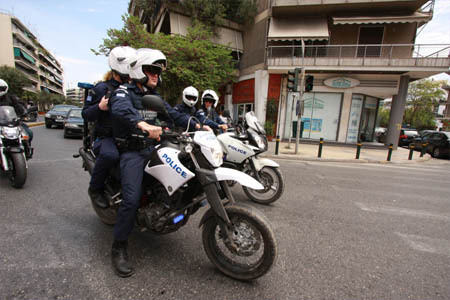 Such a security force of volunteers will further stabilize peace and security in Greece providing at the same time support to the State Police Forces in case of national emergency. Any help to this operational brand of the Hellenic Arms Control Center will be highly appreciated. As a first token of support all Greeks should link to the Hellenic Civil Guard facebook page in order to express their views and ideas about this newly born mechanism of national security. Το άρθρο δημοσιεύτηκε Σάββατο, Φεβρουάριος 11th, 2012 στις 16:01 στην κατηγορία ΣΩΜΑΤΑ ΑΣΦΑΛΕΙΑΣ. Μπορείς να παρακολουθείς τα σχόλια χρησιμοποιώντας το RSS 2.0 feed. Σχόλια και pings δεν επιτρέπονται.